The photos spend most of their time in storage. But last week, a few longtime members of St. Mary Catholic Church pulled them out and displayed them to remember the spectacular fire that destroyed their historic church 20 years ago on Sept. 2. The parish doesn't plan any other special events or commemorations to mark the anniversary, however. That's the way it's always been at St. Mary: Even when the 1993 fire seemingly brought the congregation to its knees, members wasted little time worrying about themselves. Their thoughts turned quickly to how they would continue to serve soup and provide other help to those in need. A strong faith and that giving spirit still guide the congregation today. The red brick church that burned had stood since 1886 just east of downtown at Lafayette Street and Jefferson Boulevard. A lightning strike ignited a fire in the steeple that quickly consumed most of the building. Leon Youngpeter was assistant principal at Snider High School in 1993. On the day of the fire, he decided to drive downtown to Fort Wayne Community Schools' data processing center to pick up some information. On the way, he heard sirens. “When I got close, I saw the fire and I was stunned,” said Youngpeter, who now has been a St. Mary parish member for about 27 years. He parked and watched as the steeple collapsed and crashed down into the church. Initially, parishioners feared the Diocese of Fort Wayne-South Bend wouldn't allow the congregation to rebuild, said Andrea Thomas, a St. Mary member since 1977. It was a relatively small parish — about 250 families — located “within spitting distance,” Thomas said, of the Cathedral of the Immaculate Conception off Calhoun Street and the since-demolished St. Paul Catholic Church at Fairfield Avenue and Washington Boulevard. The soup kitchen resumed operation quickly in the church's former boiler building, which was still standing. Members began meeting for worship several blocks away at St. Paul Catholic Church. “There was a terrific outpouring of community support for St. Mary,” noted Steve Sullivan, a self-described social activist who was active at St. Mary in the late 1960s and early 1970s and returned to the parish right after the 1993 fire. “I think St. Mary is the symbol of the Roman Catholic Church in Fort Wayne,” Sullivan added, noting the parish couldn't offer all of the outreach help it does without the support of the community at large. Despite the tears and grief at the time of the fire, parishioners soon began to look at the blaze differently. Trying to maintain the former building took “a lot of money,” said Thomas, who served on parish staff as pastoral associate from 1978-87 and later as a member of the parish council. In addition, the old church didn't work well for the way Catholics worship today — as a spiritual community, she said. Its long, narrow sanctuary seated 1,000 people, which was much larger than needed. It also was designed for an era when the priest celebrated Mass with his back to the congregation, and the acoustics were terrible. Thomas said the old church also had no space for religious education classes, community gatherings or meetings. “I hate to say it, but it probably was a stroke of good luck,” Youngpeter said. At the time, Youngpeter helped organize the Christmas Box program, which he started to provide Snider students, and then those of other high schools, a way to give back to the community. Students would collect food and then assemble boxes of food to be passed out to needy families for a Christmas meal. They used to assemble the boxes in the cramped St. Mary church basement. “It was an absolute dungeon down there,” he said. The basement of the new church contains plenty of room to assemble the boxes, he added. At meetings shortly after the fire, congregation members discussed the future of the parish and how the church should be rebuilt. Sullivan suggested constructing an adequate church and a modern, updated soup kitchen. “I thought it was a great opportunity to do better the things we thought are our mission as a community,” he said. 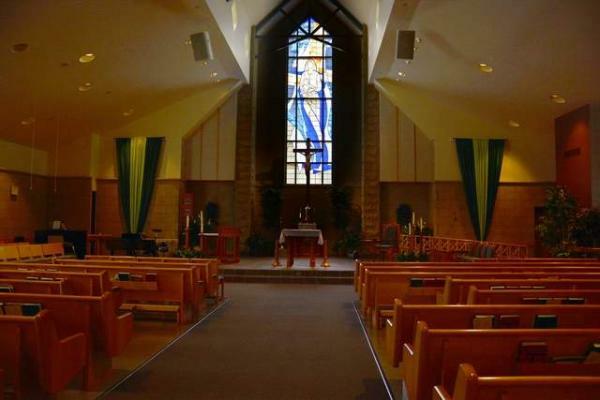 The diocese approved using about half of the insurance settlement money from the fire — about $3.5 million — to build the current church, which was dedicated May 2, 1999. With seating for about 325 people, the new church is a good size for the current 228 families and for the one Mass held there weekly at 10:45 a.m. Sundays, members said. The sanctuary is designed for people to worship as a community gathered around the altar. The church and altar both also are accessible for people with disabilities. One large room provides space for meetings and events, and dividers also allow it to be separated into classrooms for religious education, Thomas said. In addition, the new church has a large gathering space and open area outside the sanctuary. 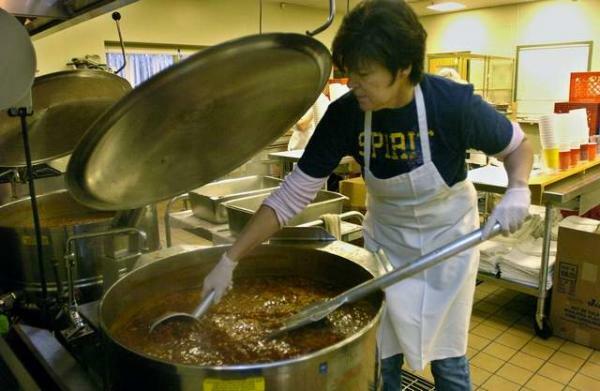 The rebuilding project also put the St. Mary's Soup Kitchen, which had cooked and distributed soup from the old church's basement, in a separate wing of the building. Its commercial-grade kitchen makes it possible to cook soup in greater quantity and more efficiently than previously. The building's design also allows needy people to step inside to a customer-service window to pick up soup. The soup kitchen currently feeds about 1,000 people a day, seven days a week, Henry said. Slightly more than a decade after the fire, St. Mary parishioners absorbed another blow when their beloved pastor, the Rev. Thomas O'Connor, died March 17, 2004, after a lengthy illness. O'Connor had been St. Mary pastor since 1970. He led the congregation in starting the soup kitchen, Matthew 25 Health and Dental Clinic, and other outreach to the needy. As they did after the fire, parishioners continued to focus on serving the poor. The church offers about a dozen outreach ministries serving the needy and people living near the church. One of the most recent is the Ave Marie House, which the congregation launched in 2008 in a home just across Madison Street from the church parking lot, Henry said. Homeless people can go there for shelter during the day, as well as to wash clothes, store personal items and use computers to apply for jobs and government food aid. St. Mary members also aware the parish couldn't offer all of the aid it does without out a lot of help from the community, both in the form of donations and volunteer service, Henry said. Recently, on the same day Henry was sorting through a stack of phone messages seeking help with hundreds of dollars in utility deposits and other needs, he also received a $500 donation check from a local community leader. The parish's Bells of St. Mary's fundraiser mailing typically results in $125,000 to $150,000 in donations to help poor and minority children attend Catholic elementary and high schools, Henry said. With the state's school voucher program making it possible for some of those families to attend private school with state money, Henry hopes a portion of the Bells of St. Mary's donations can be directed toward helping the poor through other parish ministries. It also takes 150 to 200 volunteers to operate St. Mary's ministries, and about half of them come from outside the parish — including some who are not Catholic, said Henry and the Rev. Phillip Widmann, who serves as pastor of St. Mary and also St. Peter Catholic Church, 518 E. Dewald St. The parish couldn't accomplish what is does without volunteers' help, said Henry, who is part time and works only on Tuesdays and Thursdays. But the need keeps growing, and sometimes it gets overwhelming. Current parishioners hope the congregation can continue reaching out and serving the needy in the years ahead. They also realize the parish faces challenges. The shortage of priests remains a big concern and one over which the congregation has no control, Thomas said. The parish already shares Widmann with St. Peter. When he reaches the priest retirement age of 75 in fall 2016, some St. Mary members wonder whether the diocese will have enough priests to replace him. Many people currently leading or active in St. Mary ministries also are aging. The parish will need new, younger people to step in and carry on the work. But members are optimistic that, just as the congregation rose from the ashes of the 1993 fire, the spirit and ministry of St. Mary will survive. “We passed on to our children what it means to be a member of a faith family, and them to their children,” Thomas said. “I think the church in general needs places like St. Mary that are open to people with different hopes, people with different needs and people with different ideas,” she said.